The Gut and Psychology Syndrome (GAPS) diet was originally designed by Dr. Natasha Campbell-McBride to treat autism, dyspraxia, ADD, dyslexia, ADHD, depression, schizophrenia and other psychological disorders. Because GAPS heals and seals the gut, it has found a following amongst those with celiac, Hashimoto's and other autoimmune disorders. Recent research indicates T2 diabetes may be an autoimmune disorder, thus my experiment of n=1 to see if GAPS improves my health after 25 years as a T2. Grass-fed bones are certainly better than CAFO bones, but I think this difference is much lesser than with meat. In general, I am quite happy buying non-organic bones. If the animal had bones, it has minerals. If it could stand up (a requirement in order to slaughter for food), it has collagen in it's joints. The only serious downside to CAFO bones is that the marrow will have significantly less vitamins A, D3, K2 and the fatty acid CLA. However, since I cook little bone-containing beef cuts and have to buy bones, I usually buy CAFO bones, figuring I get a lot of those nutrients from other foods in my diet. These bones have the most marrow; they are shank bones. Marrow can be eaten prior to using the bones for broth as a nutritious and gourmet dish, or allowed to disintegrate in the broth to add more nutrition there. Marrow contains significant vitamin A (though much less than liver), more vitamin D3 than any other organ (about the same as fat), 10-20 times as much vitamin K2 as other organ meats and a high level of CLA (see references). So an advantage of using marrow bones is that if you are squeamish about organ meats, you can dissolve the marrow into the broth and hide it from yourself! These are preferred for providing a lot of collagen, and thus gelatin in the final product. In addition, they contain a lot of marrow also. These are the bones right above the cow's hoof and are the best bones for gelatin. These might be anything, but are usually cheaper than "named" bones. Often, these will be somewhat meaty bones like ribs or neck bones, which add a good bit of flavor to your stock. You can often get an even better deal on bones if you buy them as"dog bones". While the marrow and gelatin content may not be as high as the bones referred to above, there will certainly be just as much mineral content. This is basically marrow bones with the meat left on; a good recipe follows below. This is about the only beef we eat regularly that has bones worth saving for stock. I tend to braise or crockpot the ribs (see recipes). Short ribs are very greasy if you don't remove some of the fat, so this fat is saved for the broth-making. GAPS recommends using gelatinous meats and oxtail is the absolute winner here. It has a lot of fat, cartilage and bone marrow. Again, check recipes for what to do with oxtail. On stage 1 of GAPS intro, one is supposed to eat only boiled meats and stocks; roasting comes in at a later stage. I prefer roasted meat and stocks as I greatly approve of the flavors added by the Malliard reaction with both beef and pork; the only stock I can really enjoy just boiled is chicken stock, and even that I prefer roasted. Therefore my beef stock and meat will not be used until stage 4. I had in my freezer 1 1/2 lbs shank roast, 2 lbs knuckle bones and 2 lbs soup bones, all grass-fed. 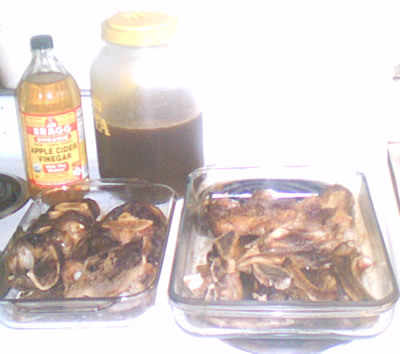 I thawed and rinsed the bones, then placed in a roasting pan coated with a few tablespoons of coconut oil. I turned them all over to coat on all sides, then roasted at 350 degrees. While roasting, I turned them every 15-20 minutes so all side would brown well. It took about 40-50 minutes for me to be happy with the amount of browning. 5 1/2 lbs bones is definitely too much for either my crockpot or pressure cooker, so the broth had to be made in a stockpot on the stove. Luckily, it is reasonably cool here now. I added 4 cups vegetable broth (see recipes) and a couple "glugs" of vinegar (which assists in leeching the minerals from the bones) and topped off with well water and brought the whole thing to a boil. After about an hour, I used a slotted spoon to skim off the scum, then covered and reduced the heat to a simmer and ignored it for 24 hours. The next day, I strained my broth into quart containers to temporarily store in my fridge. My yield was 7 quarts of thick, concentrated broth with a nice fat cap; then I added the remaining bones, meat and fat back to the pot, added more vegetable broth, vinegar and water, and repeated the process. After the second day making broth, I got 5 quarts stock. By now, the bones were soft, and all but the largest joints could be broken up and the marrow pushed into the pot. Again, I added vegetable broth, vinegar and water and continued. After the third day of simmering, I got another 5 quarts stock. 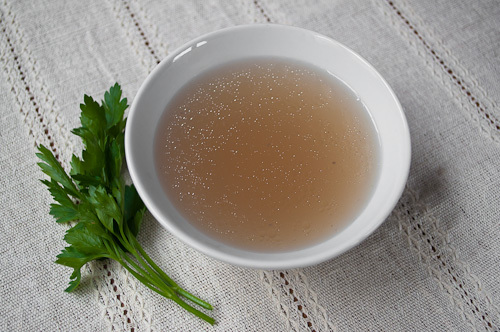 On refrigeration, the stock gelled, but had a very small fat cap, but was thick with minerals as most of the smallest bones had largely dissolved. The few bones remaining were very large and had absolutely no soft tissue remaining, inside or out. All the goodness from all the fat, joints and marrow was in my broth. I also yielded 2 pints of meat. Granted the meat has been boiled to death by now and is relatively flavorless, but it will work either as an addition to soup made with the very flavorful broth or in other highly-flavored dishes, like a curry, taco meat, etc. You can continue doing this, but eventually, you get to the point where the broth is not as yummy, it doesn't gel and likely isn't as nutritious as the earlier batches. You can potentially add some gelatin, some vitamins D3 and K2 drops, and some Concentrace (see products) to make it more nutritious, but you can't really make it much yummier as broth, per se. It works better for things like cooking rice or beans than as a base for soup. Eventually, I was done and moved the containers to the freezer, along with the recovered meats. My total yield was 17 quarts stock and 2 pints meat. Cook 1/4 lb uncured bacon in cast-iron Dutch oven over medium heat; remove bacon with slotted spoon and set aside to drain on paper towels. Dry 2 lb beef short ribs well with dish towel and season to taste with unrefined sea salt and freshly-ground black pepper. Raise heat to high and brown short ribs on all sides in bacon grease; remove short ribs with slotted spoon. Reduce heat to medium and add a diced medium onion, 3 diced medium carrots and 2 minced shallots and cook for about 2 minutes. Deglaze pan with 2 cups dry red wine and cook for another 2 minutes. Add 2 cups beef stock, 2 sprigs thyme, 2 sprigs rosemary and season with unrefined sea salt and freshly ground black pepper to taste. Add cooked bacon and browned ribs to braising liquid, cover Dutch oven and place in oven for 2 1/2 hours, or until ribs are fork-tender. If desired, spoon some of the fat off top before serving. Dry 3 lb beef short ribs well with dish towel and season to taste with unrefined sea salt and freshly-ground black pepper. Brown in 2 TB coconut oil in cast-iron skillet in batches, removing to crockpot as browned on all sides. Fry 1 diced yellow onion, 1 stalk diced celery and 1 diced carrot in same pan. Remove with slotted spoon to dish and refrigerate until next day. Deglaze pan with 2 cups red wine and cook until thick and syrupy, about 15 minutes. Add to crockpot. Add 3 cups beef stock to crockpot. Cook on low for 6-8 hours. Let cool and place in fridge overnight. Next day, remove layer of grease from top, add vegetables to crockpot, and cook on low for 2 hours. I keep a large container in my freezer. Onions peels and ends, bell pepper tops and seeds, tomato ends, cuttings from celery ribs, peelings from carrots, the outer leaves and cores of cabbages, garlic peels, ginger root skin, and herb stems - all these go into the container until it is jammed full. If I have veggies in the fridge that I do not get to, that are starting to be limp or have bad spots, I put those in too (cutting off any bad spots). My advice is to avoid potato skins, as though they add lots of potassium, they make the broth taste dirty. Also, I greatly limit the amount of cabbage as I don't want all my broths to taste all cabbage-y. YMMV. When I have the container jam-packed full of veggie stuff, I put this in my crockpot. The size of the container is such that the stuff barely fits into my crockpot. Then I add water to cover and turn it on low overnight. The next day, I put a strainer over a bowl and begin moving the broth & veggies over. I press down on the veggies to extract as much broth as possible, then discard in my compost bin. The resulting broth is stored in a sun-tea container in my fridge if I will be making broth soon or in quart-containers for freezing if not. This method means I don't have slimy bits of vegetables in my bone broth. If I make a meat/bone broth, this makes the meat much easier to extract. If I make a broth from only bones, it matters less and I might make it with the veggies directly since everything strained out will be discarded anyway. Cool. Thanks for sharing with Simply Delish. I'm not a big fan of CAFO products. As you've said, this jave significantly less vitamins A, D3, K2 and the fatty acid CLA, and I totally agree with that. At the end, it's still best to go with the natural sources. I don't disagree with you, Misty. But if budgetary constraints limit the ability to buy pastured meat, I'd rather buy grass-fed meat and CAFO bones. I also think even CAFO broth beats no broth. For the long version, see comment policy in the footer of each blog page.